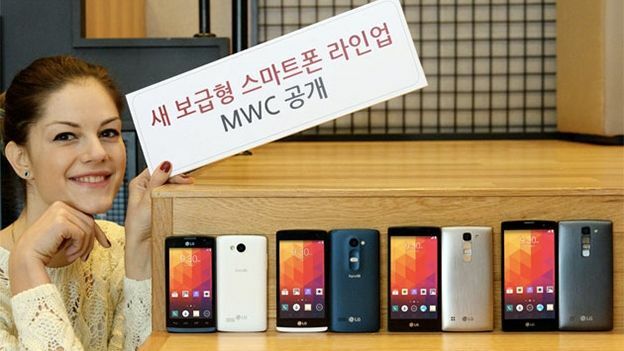 Seemingly unsatisfied that it wants to rock the wearables world at Mobile World Congress, LG is set to unveil two new smartphones with front facing cameras aimed squarely at the selfie market. While the phones themselves may be middle of the market in terms of power, before LG smartphones certainly aren't underpowered when it comes to their front facing cameras. Indeed, the LG Magna and LG Spirit don't just come with five megapixel front facing cameras, they've also been designed to be selfie-stick friendly. That's because LG has tweaked its gesture recognition software to work better on the sticks. Aside from the cell-free friendly camera, both phones are decidedly middle of the road. The LG Magna comes with a 5-inch HD display, while the LG Spirit comes with a 4.7-inch HD screen. Both phones come with a 1.2GHz/1.3GHz processor depending on the market (LG hasn't given us further details yet) and 8GB of storage. The Magna comes with the larger battery at 2,540mAh, while the Sprit features a smaller 2,100mAh one. They also feature LG's buttons on back design. Expect pricing and availability details next week at Mobile World Congress.